Russia is marking 70 years of victory over Nazi Germany in World War Two with a huge military parade in Moscow. Thousands of troops are marching on Red Square in Moscow, and new armor being displayed for the first time. More than 20 heads of states are in Moscow, but many world leaders are boycotting the event because of Russia’s role in the Ukraine crisis. As the event began, Russian President Vladimir Putin said international co-operation had been put at risk in recent years. Russia denies claims by the West that it is arming rebels in eastern Ukraine. More than 6,000 people have been killed since fighting began in April 2014 in Ukraine’s Donetsk and Luhansk regions. In his speech, Vladimir Putin paid tribute to the sacrifices of Soviet troops during World War Two. He also thanked “the people of Great Britain, France and the United States for their contribution to victory”. The remarks echo previous complaints by Vladimir Putin about what he says are efforts by the US and its NATO allies to encircle Russia militarily. The victory parade started at 10:00 local time. Chinese President Xi Jinping, President Pranab Mukherjee of India and UN Secretary General Ban Ki-moon are among more than 20 world leaders watching the event. Military units from across Russia – some dressed in WWII-era uniforms – are marching, and more than 100 aircraft have flown over Red Square. The most talked-about new high-tech Russian armor is the T-14 Armata battle tank, which has a remote-controlled gun turret and reinforced capsule for the crew. The RS-24 Yars intercontinental ballistic missiles – each capable of delivering three nuclear warheads – were also on show. In a sign of closer ties between Russia and China, a column of Chinese troops marched in Moscow for the first time. 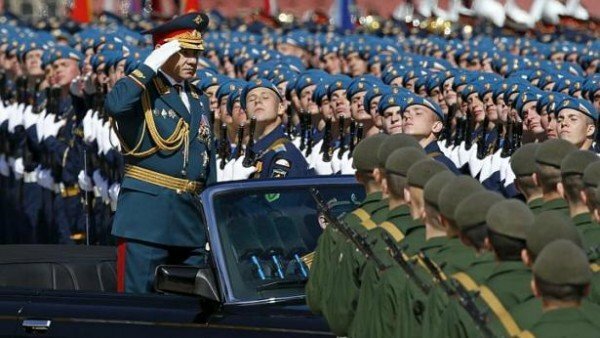 Military parades on a smaller scale are also being held in other cities, including Sevastopol in Crimea – Ukraine’s southern peninsula annexed by Russia in 2014 – as well as the Ukrainian rebel-held cities of Donetsk and Luhansk. The US, Australia, Canada and most of the EU heads of state are boycotting the celebrations in Russia over its alleged involvement in the Ukraine crisis. On May 8, Poland organized an alternative event for those leaders who refused to go to Moscow.